i was looking through old pictures and found this project that i promised a tutorial for. it never happened. i need to make a list of tutorials and blog posts that i wanted to do, but forgot about. those are really cute Kim!! Lots of photo editing on my agenda for today, and for my week as well! these are so cute! I love the paisley print! I have so much to do today that I don't think a list would suffice. I think just straight up momentum is going to be the name of the game today, since I'm going to start cleaning our utility room, which has been kind of a catch-all room for six months now. Those tin cans are pretty sweet looking. Yes I am a list person too, but I lose them all over the place:-) Your blog is super cute, and I can't wait for your tutorials!!! 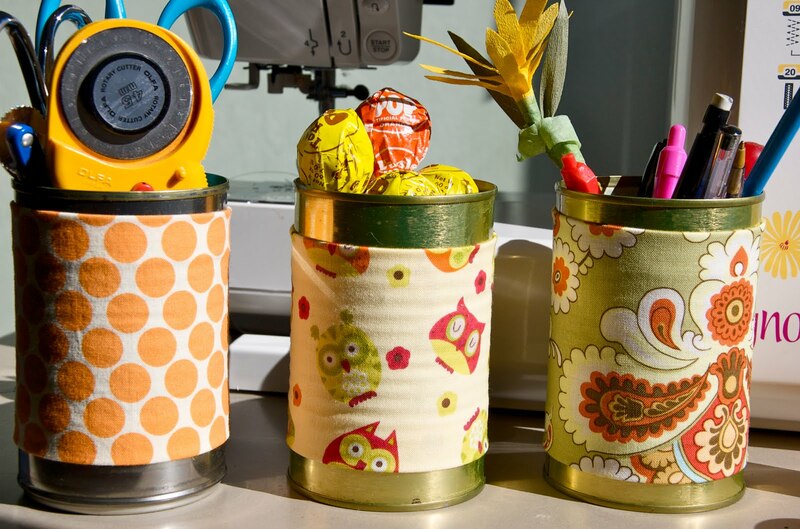 What a cute way to dress up something instead of tossing it in the recycle bin! Thanks for commenting on my little skirt tutorial and shirt applique! you know what?? i haven't sewn in FOREVER, foreals!! how am i going to start up my etsy shop if i don't bust out the ole sewing machine?? :( love those cute fabrics you used for your tin cans, and your tutorials are fabulous! :) can't wait to see them!